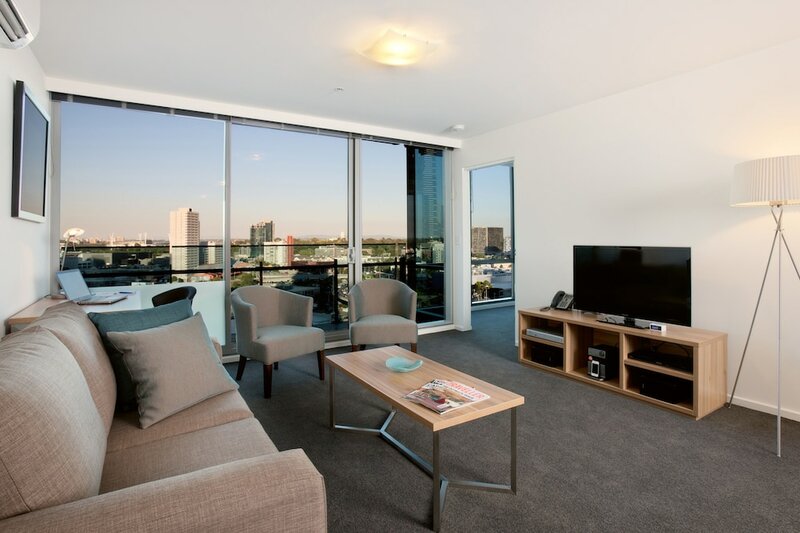 Located in Southbank (Melbourne Central Business District), Melbourne Short Stay Apartments MP Deluxe is within a 15-minute walk of Melbourne Convention and Exhibition Centre and Eureka Tower. This 4.5-star apartment is 0.5 mi (0.8 km) from Eureka Skydeck 88 and 0.6 mi (0.9 km) from South Melbourne Market. Make yourself at home in one of the 60 air-conditioned rooms featuring kitchens with full-sized refrigerators/freezers and stovetops. Rooms have private balconies. 39-inch LCD televisions with cable programming provide entertainment, while complimentary wireless Internet access keeps you connected. Conveniences include desks and separate sitting areas, and housekeeping is provided on request. Don't miss out on recreational opportunities including an indoor pool and a fitness center. This apartment also features complimentary wireless Internet access, concierge services, and babysitting/childcare (surcharge). Featured amenities include limo/town car service, dry cleaning/laundry services, and multilingual staff. Self parking (subject to charges) is available onsite. Melbourne Short Stay Apartments MP Deluxe features an indoor pool and a fitness center. Wireless Internet access is complimentary. This luxury apartment also offers tour/ticket assistance, multilingual staff, and concierge services. Onsite parking is available (surcharge). Melbourne Short Stay Apartments MP Deluxe is a smoke-free property. Recreational amenities at the apartment include an indoor pool and a fitness center. Cribs (infant beds) are available for AUD 18.50 per night. This property's policy is to refuse certain bookings for the purpose of group events or parties, including pre-wedding stag/bachelor and hen/bachelorette parties. Parking height restrictions apply.